Capitol SM-2020 vinyl LP (197?) 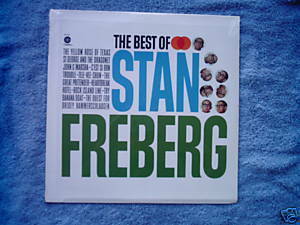 The Best of Stan Freberg The Yellow Rose of Texas/John and Marsha/St. George and the Dragonet/Banana Boat/Ya Got Trouble/Tele-Vee-Shun'//C'es Si Bon/Heartbreak Hotel/Rock Island Line/The Great Pretender/The Quest for Bridey Hammerschlaugen/Try Sealed, unopened.